What is zydeco? The origin of the term zydeco is unknown, however, a few interesting theories exist. For instance, one theory suggests that the term is a transliteration of zarico, which means snap peas. Other versions of the word are: zarico, zodico, zordic and zologo. Also, it was the name of a band in the early 20th century called the Zydeco Skillet Lickers. Alternately, another theory suggests it came from the music of an Native American tribe called the Atakapa, who interbred with African slaves. Meanwhile, the term is used for both a type of music and a dance style that originated in Southwest Louisiana. Acadians, Creoles, Native Americans and African slaves populated this region over four hundred years ago. The mingling of these different cultures created the genesis for the Cajun culture, as well as, the zydeco music and dance. The Acadians are the descendents of the French colonists in Nova Scotia, New Brunswick, Prince Edward Island in Canada. Most of these inhabitants came from Ile-de-France, Normandy, Brittany, Poitou and Aquitaine, France settling in Canada. From 1755 to 1764 the English deported 11, 500 Acadians during the Great Expulsion. Some were shipped back to France but many migrated to Louisiana evolving into the Cajun culture. The Acadians intermarried other ethnic groups including Africans and Native Americans to form a new ethnic group called the Cajuns. In addition, there was a group of people called the Creoles, which referred people of mixed European and African or Native American descent. This melting pot of cultures came together to create a Cajun culture with unique food, music and dance. This region in Louisiana is sometimes referred to as Acadiana. Zydeco music evolved in Louisiana among the French Creole people. It is a blend of blues, R&B and indigineous music. Later, it incorporated soul, reggae, hop hop, ska, brass, Afro-Caribbean and gospel music. 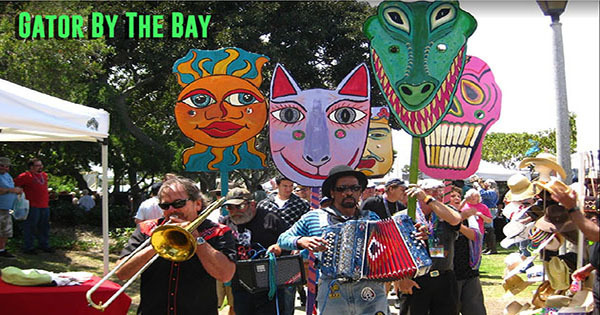 Instruments used for zydeco dance and music include piano and button accordian, washboard (sometimes called rubboard or vest frottair), steel guitars, drums, banjos and even at times, the mandolin. Chifton Chenier, aka The King of Zydeco, popularized the music in the 1950’s. Also, in the 1980’s Rockin’ Sydney had the hit tune, My Toot Toot. Chenier’s hit tune along with others started the Cajun & zydeco revival of the 1980’s, which continues to present day. Other popular zydeco musicians include John Delafose, Boozoo Chavis, Roy Carrier, Buckwheat Zydeco and Lil Nathan. In the 1990’s, Beau Jocque added brass and other musicians added funk, hip hop and rap to the music. Also, Chris Ardoin and Keith Frank added more syncopation to the rhythms. In addition, in the 2000’s other artists had popular songs including Lil’ Nate, Keith Frank, Mo’ Mojo and Kenne Wayne. 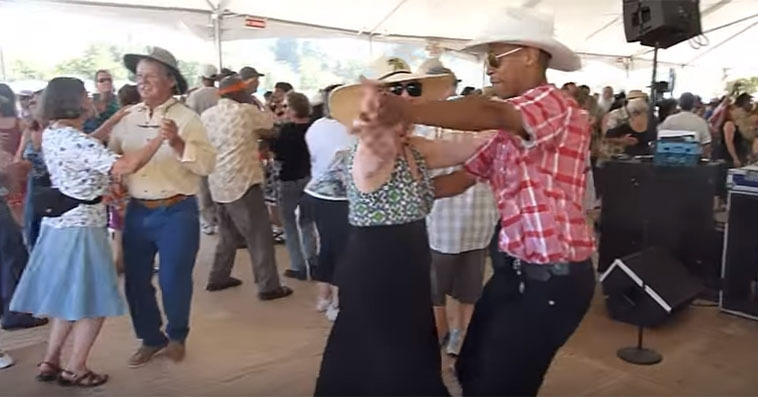 The zydeco dance is one of the many Cajun dance styles. For example, there is a Cajun waltz, Cajun two-step and Cajun jitterbug. These dance genres are to the music that originated in the early 20th century from the Francophone Creole Acadians. In addition, the music and dancing have earlier roots in medieval France, Canada and early American culture. The dance consists of two four beat parts using a total of eight beats of music. Each part consists of a step-pause, step, step with a step-pause using two beats and a step using one beat of music. In addition, the rhythm is sometimes referred to as SQQ, SQQ where the S=2 beats and the Q=1 beat. Also, the dance uses predominantly closed or promenade positions but occasionally dancers do one hand, two hand or cross hand movements. The closed position basic often rotates clockwise. Additionally, accents are sometimes used on the two and six beats (replacing the pauses) including kicks, taps, flicks, brushes or stomps. Finally, at times rhythm variations are substituted. For example, a touch step can substitute for a step-pause. Cajun dancers do an eight count two step with a rhythm of QQS, QQS around the dance floor. Also, there is a six count variation that is QQSS that resembles the country western two step. 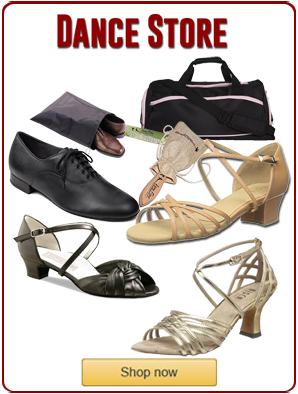 The Cajun waltz uses a three beat rhythm that moves counter clockwise around the floor similar to the C&W waltz. Finally, the Cajun jitterbug or jig is similar to the C&W pony swing using a touch step repeatedly with lots of turns.